Okay, first off – I’m all about the ‘family bed‘. I loved, loved, loved waking up in the morning with a teeny baby stretching their soft bare feet into my stomach. And for years we had kids in our bed in the wee hours – because they had wet theirs or got scared in the night. Now our sweet grand-baby is coming for a weeks visit, and despite my comfort with family bed it has been me that has been encouraging my daughter to try – just try- to get our nine month old granddaughter to spend at least some part of the night sleeping in her own little crib. I didn’t mind my babies in my bed, but at some point in the early evening I put them to sleep in their own cribs and had some hours to myself – well, not always to myself, but with two, then three, then four kids I had some time when I wasn’t taking care of the needs of the tiniest. My daughter has decided she would like that, as well. Her and the baby’s daddy have spent the better part of two weeks with that goal in mind – they’ve been frustrated, they’ve been exhausted, they’ve been pleased – as they struggle through this stage that I promise her almost daily will pass so quickly that they will forget what it was like to not have a few blessed hours in the evenings to themselves again. Which brings me to the search for the illusive, mysterious, just out-of- reach portable crib. I’ve got four kids and one granddaughter. I’m a grandma (one of those young-ish, hip grandma’s as I’ve pointed out before). Grandma’s house should have a crib in it. My mom’s did for almost a two decades of grandchildren – my grandmother’s had one forever – until she went into a nursing home at age ninety-four. We’ve recently renovated making bigger spare bedrooms and replaced all the kids’ (now adults living away) single beds with brand new queens – and have NO room for a full size crib. What to do? Buy a portable crib – a mini crib – a apartment size crib. Simple item to find in a city of a million people and how many grandma’s? I started off at Ikea. The Swedes wouldn’t let me down, would they? You bet they would. From there I rolled into several large baby needs supply stores. “I’m looking for your apartment size cribs,” I said, adding that I was the grandma, in case they thought I was one of those fifty year old moms you read about in the papers. I was met with a whole lot of blank stares and then usually the suggestion of a play pen. I don’t want sweet baby in the bottom of a playpen all night with their rigid folding pads. I’m trying to replicate what I’ve encouraged my daughter to do for ten exhausting nights – so she can have some fun with us in the evenings (we’re fun) and not go backwards with baby sleeping with mommy from bedtime to sunup. I went on-line. Wow – everyone sells them on-line – Costco and Wal-Mart and Sears, so the next day I rolled out to those stores to learn they don’t stock any such item in Canadian stores. What’s with that? Is it something about the great white north having more space – grandparents that spent a stupid amount of money renovating up here in the Colonies would have thought about the extra 70 cm. by 130 cm. (28 by 52 inches) needed for a crib? Do they think we have big hulking babies here in the North who need big cribs only? Granddaughter is lean with delicate fine features. Finally a saleswomen in a second hand baby store went above and beyond, and told me, given a few minutes on her computer, she would indeed find the illusive portable crib. And to my dazed amazement she did – through, of course, a company that supplies to local daycares. Perfect. Grand-baby can sleep in the sweetest little crib, on wheels that slide through a bedroom door AND it folds up – if she is here in six to eight weeks. Darn. (Grandma’s don’t use language stronger than darn – never the f-bomb in absolute frustration over how difficult the search has become.) Okay, stay calm. Short term solution – I would rent. I quickly discovered three companies run by lovely women that rent out baby equipment only – mostly to grandma’s suppressing the f-bomb after trying to buy the darling little portable crib. First company is fresh out of cribs – portable and full size. Second and third company turn out to be one and the same (?). On-line I learn that from this company I can pick up the perfect folding bright and shiny crib at the airport for $35 extra, or have it delivered to my house for $40 above the rental cost of $82 which is similar to that of buying a very inexpensive full size crib (that doesn’t fit.) Or I can choose to save the $40 and pick it up from the home office of the company, which is what I opt for in my effort to not spend as much as I have already spent on ordering the crib from the on-line catalog that will arrive after baby goes home. No where on-line does it tell me that the rental company is located forty minutes outside the opposite end of the city. Ah well, if was a lovely country drive with a good friend. My daughter and our grand-baby arrive this evening. The clean, fresh portable crib will be all set up with just-laundered bedding and a little stuffed lamb tucked inside. 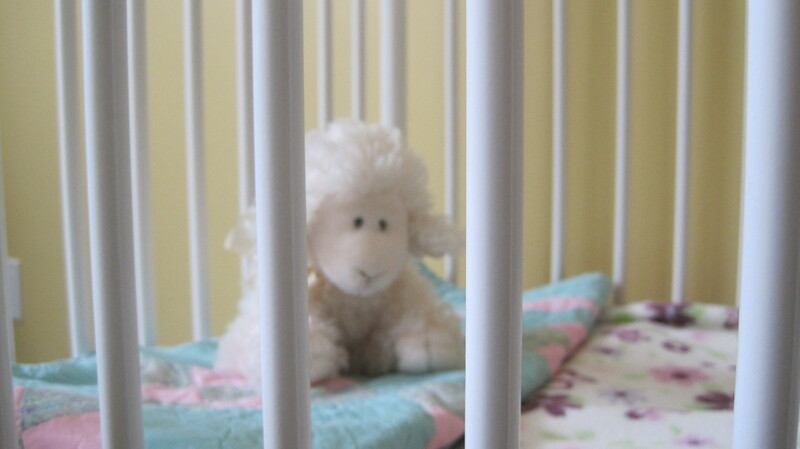 The lamb will likely sleep alone as my soft-hearted well intentioned daughter will decide baby’s routine has been interrupted too much already and she can sit up with us and then go to sleep wrapped up in mommy’s arms in the big queen bed. well, the question is will ‘they’ use the crib tonight, or not? My daughter and baby grandson came for the holidays from London. The first time he was here, I had borrowed a Portacrib from someone. But now he needed a crib, which I don’t have room for. Hence, the hunt for the apartment-size crib, one that could be folded and stored away. It was a nightmare. No store sold them. I ordered one from Target, but the days dragged on and they couldn’t guarantee that delivery would be before Christmas (!!!). I cancelled the order. They attempted delivery anyway. I went berserk. I finally found a warehouse-type place in DC that orders commercial products from all over and could order me one. I was given the choice of going there and picking it up or paying a lot extra to have it delivered. I was so exhausted by then, I paid the money for delivery. The result was that my grandson had a new crib (delivered the day before he arrived!) that he slept in (most of the time). Whew. Sure is tough being a grandma sometimes.